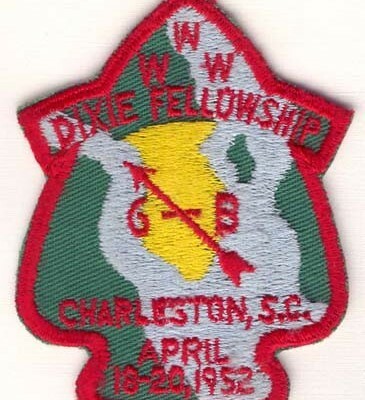 The Dixie Fellowship is the Order of the Arrow conclave for 11 lodges that stretch along a center line across the North Carolina / South Carolina border. In the west it reaches Asheville, NC (Tsali 134) and dips down into eastern Georgia with Augusta (Bob White 87) and Savannah (Tomo Chi Chi 119). The name was first coined for the event in 1952 and this annual gathering has been held every year except 1969 when no conclaves were held across the country. Through different alignments the Dixie has contained as many as 14 different lodges in multiple configurations over time. Since the early 2000s the current makeup of 11 lodges has held firm. The memorabilia issued by the Dixie is highly collectible and has a history that dates back to the 1947 Area Z patch. The modern Dixie includes a variety of items including member lodges producing memorabilia promoting their spirit theme for the weekend. Submitted by Lodge Editor Larry Banks Please leave comments below!